It was supposed to be an easy job: find the Dark Star Revolution Starships, destroy them, and go home. But a booby-trapped vessel decimates the Meridian Alliance fleet, leaving Serengeti - a Valkyrie class warship with a sentient AI brain - on her own, wrecked and abandoned in an empty expanse of space. On the edge of total failure, Serengeti thinks only of her crew. She herds the survivors into a lifeboat, intending to sling them into space. But the escape pod sticks in her belly, locking the cryogenically frozen crew inside. Then a scavenger ship arrives to pick Serengeti's bones clean. Her engine's dead, her guns long silenced; Serengeti and her last two robots must find a way to fight the scavengers off and save the crew trapped inside her. Yes, I would recommend to a friend, it was a refreshing storey line to listen to, I hope that there will be a follow on book. It was the ship AI's and maintenance drone/bots that were the main characters. What does Elizabeth Wiley bring to the story that you wouldn’t experience if you had only read the book? I don't think someone else could have played the part, the warmth and feeling came through right to the end. No, just a satisfied feeling that the fleet came back looking for Serengeti. I hope that there will be other stories about Serengeti in the near future. What could J. B. Rockwell have done to make this a more enjoyable book for you? highly emotional AIs and silly humans--what more could you want? Oh, wait--space battles fought at short ranges with manually controlled artillery. poor sound quality. very dull and hard to make out words. other books from audible just fine to hear. This is a cute droid novel, but it has absolutely no relation to the reality of physics. Unfortunately it is all contrived and is not believable and also not very satisfying. I barely made it through at 2x speed. The narrator was fine. Has Serengeti turned you off from other books in this genre? The author needs to study basic physics. Obviously J.B. Rockwell has no knowledge of basic science. This is a different and interesting story. 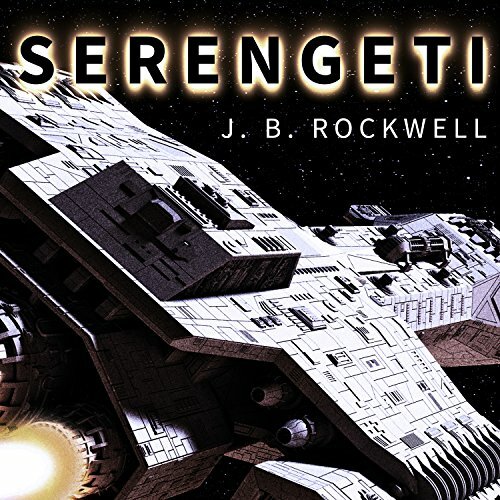 Serengeti is a Valkyrie class Warship with a sentient AI brain. The AI ships are special. Their personality depends on the kind of spaceship they are in. They have complete authority over the captain. Serengeti belongs to the Meridian Alliance fleet and they are at war with the Dark Star Revolution fleet. The two fleets have a battle and Serengeti is badly damaged and is on the edge of total failure. She was unable to evacuate her human cryogenically frozen crew and send a distress signal. Scavengers board the ship and Serengeti and her two robots must fight them off and save the ship and crew. Rockwell made the AI and robots very humanized almost too much so. Had the feeling this book was written for young people. I had to suspend belief a few times but overall it was a fun book and a bit different from the usual space operas. The book was well written and the robots were cute. The book dragged a bit in the middle of the book. Wiley does a good job narrating the book particularly between Serengeti and her robots. Wiley is an actress and an award winning audiobook narrator. So much action and emotion. Unlike AI characters in other books, I actually cared what was going to happen to Serengeti. Also enjoyed the range of depth in the story, from massive space battles down to the intimate struggle to survive. I haven't loved a book like this in years. This isn't the story of Space Marines. This isn't a story of human verses aliens. This is a story of a the wreck of Serengeti. A proud and distinguished Valkyrie class warship and her duty to her crew. Follow Serengeti and her Herculean efforts to save what is left of her crew. Stuck in Cryogenic hibernation. Through power droughts. Invading scavengers and her own slowly devolving physical structure. Nothing will stand in her way of saving her crew. She has her exceptional wits and the hands of two small repair droids fending off entropy and working to save the crew. The narrator brought Serengeti to life. She was brilliant and I will look into other books she might have narrated. If you like SciFi I highly suggest trying Serengeti for the off beat and generous story the author has weaved for our entertainment. This could have been a great story, but it wasn't executed well, it became nore of a slog than anything else. Add to that the highly unlikely way the author wiped out characters starting with the gunner. Sure they were under attack, but how do you explain every bridge station had nothing worse than burnt out circuit boards, and yet the toughest structure there, the gunner's pod was crushed? Really? Then they are on their way to the life pod, there is very little air in the hall, yet not only did the breach not prevent them from getting to the pod, it also didn't prevent them from having a conversation while standing in the doorway of the pod. Then you're going to tell me that a lifeboat launch is going to have a system so complex to launch it that it requires a fully functional ship to launch it? Who would design an emergency system to require a fully operational ship to launch it? No, too many things wrong with this one. I give it 3 stars, but 2.5 would be more accurate. And we haven't touched on robots having so little power that they all suicided to make sure there was enough power to run the ship, then tig creates another one? Not the best use of resources. Plus it was never explained why recharging the dead bots wouldn't work. Not one of the better books I've read on audible. Welcome to the Crew of Serengeti! Who would have guessed that a book mainly about a ship and some robots could be so fantastically captivating?! I wish Serengeti was a series. The narrator does great voices for each character and the author did a wonderful job of giving each artificial intelligence a full, rich personality. I cannot recommend this book enough! Now, off to try more J.B. Rockwell books! I listened to 2/3 of this book before giving up. There's very little plot once the initial battle is over and there wasn't enough of an introduction to the few human characters to make me really be invested in their survival. Neither the human characters nor the AIs are particularly bright, either... traps that were blatantly obvious were entirely overlooked by both parties, etc. AIs communicate with each other in cutesy ways that are obviously geared toward the human reader instead of being in any way realistic. Returning this one. The first part of this story was written very well and kept me intrigued throughout. Somewhere along the storyline the Warship's AI changed personalities into a mid-century British nanny. Too many references and input from a human thought and limitations. Again, the story was a good one which held me till the end but I gritted my teeth in the second half. Not sure if I will follow the series if there is one.